Solieria filiformis (Kützing) P.W.Gabrielson recolectada en la zona Sur del Macizo Guamuhaya. Foto: Ángel Moreira. Published in: Gabrielson, P.W. (1985). Agardhiella versus Neoagardhiella (Solieriaceae, Rhodophyta): another look at the lectotypification of Gigartina tenera. Taxon 34: 275-280, 2 figs.. Type locality: Antigua Island, Antilles (Silva 1996-to date). Lectotype: L 941,98...429 (Gabrielson 1985: 278). Notes: comm. Lappe. Klein, J.C. & Verlaque, M. (2011). 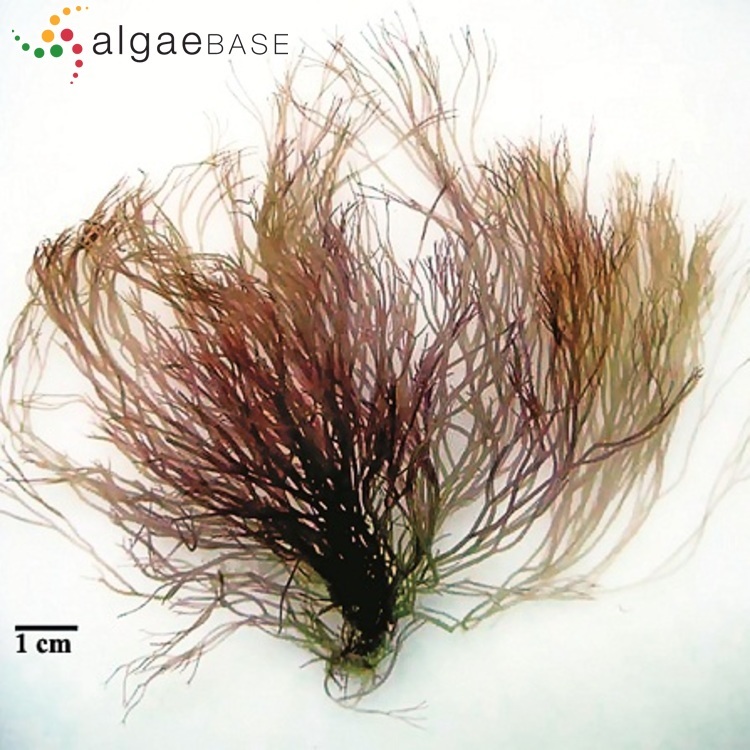 Macroalgae newly recorded, rare or introduced to the French Mediterranean coast. Cryptogamie Algologie 32(2): 111-130. Perrone, C. & Cecere, E. (1994). Two solieriacean algae new to the Mediterranean - Agardhiella subulata and Solieria filiformis (Rhodophyta, Gigartinales). Journal of Phycology 30(1): 98-108, 36 figs. Accesses: This record has been accessed by users 4082 times since it was created. Dawes, C.J. & Koch, E.W. (1988). Physiological acclimation of the Caribbean seaweeds Eucheuma isiforme and Solieria filiformis (Rhodophyta, Gigartinales) in culture. Carib. J. Sci. 24(3-4): 89-94. Perrone, C. & Cecere, E. (1997). Regeneration and mechanisms of secondary attachment in Solieria filiformis (Gigartinales, Rhodophyta). Phycologia 36: 120-127, 17 figs. Robledo, D. R. & García-Reina, G. (1993). Apical callus formation in Solieria filiformis (Gigartinales, Rhodophyta) cultured in tanks. Proceedings of the International Seaweed Symposium 14: 401-406.